The Urban Politico: Black Men Don't Belong Here!!! I don't know if these sorts of incidents are actually happening more frequently or if we are just hearing about them more often but they give the lie to the bromides that (1) people don't notice race or (2) that Black American men get any sort of benefits from patriarchy. In both cases referenced in this post the unfounded fears or aggression of white women led them to confront and invoke the threat of state violence against Black men. Fortunately for the men involved they managed to avoid being shot or assaulted but it could have just as easily gone the other way. It is impossible for me to imagine social sanction for a Black woman claiming to be in fear of her life by the mere presence of a white man or seeking to bully him out of the public space if all he was doing was minding his own business. In both instances white women made automatic assumptions that blackness was not allowed in their surroundings and needed to be expelled. There are of course younger Black people who look back at the responses of Black Americans to state sponsored segregation and violence before 1970 or so and find them lacking. If these sorts of incidents continue to occur we'll find out who really is ready to stand up to the Beast, so to speak, and who was just flapping their gums. If you're Black in America, particularly a Black man, you have to be ready for this sort of thing. It can happen any time any where. We've seen a white woman in South Carolina assault Black boys at a pool, a white man in North Carolina demand to see a Black family's pool id, a white woman in Tennessee try to kick a Black family out of the pool, a white woman in Yale call the police on the fellow black student taking a nap, and too many more incidents to mention. Clearly most whites do understand just whose side the police are likely to take. I do think that Trump's election has given permission to certain people to share their true feelings. (FOX 11) - A man told his story about an experience he described as racial profiling in a neighborhood where he was parked in his car. Ezekiel Phillips said if he weren’t black, a white woman would have never felt threatened by his presence. “You don’t have to call 911 on me. Talk to me. Ask me my name,” Phillips said. The incident happened around 1 p.m. in May 30. Phillips had just dropped someone off near 1470 Ramillo Avenue in Long Beach and decided to take a 30-minute break before going to his yoga class, which was around the corner. He was listening to his bikram yoga CD in when a woman walked up to his car. "You’re not supposed to be here. This is a good neighborhood. At that moment I’m like, ‘wait hold up’. Have a good day ma’am. Namaste. And I rolled my window up,” he told FOX 11 reporter, Leah Uko. The verbal exchange escalated from there. Not content to let Long Beach have the spotlight as a place where backward people congregate Indianapolis decided to throw its hat into the ring. Because of the (oft sexualized) display of skin and unavoidable sharing, pools and beaches have historically been places where whites prevented Blacks from enjoying or at least only rigidly segregated areas. This was so widespread that even today a high percentage of Blacks can't swim. 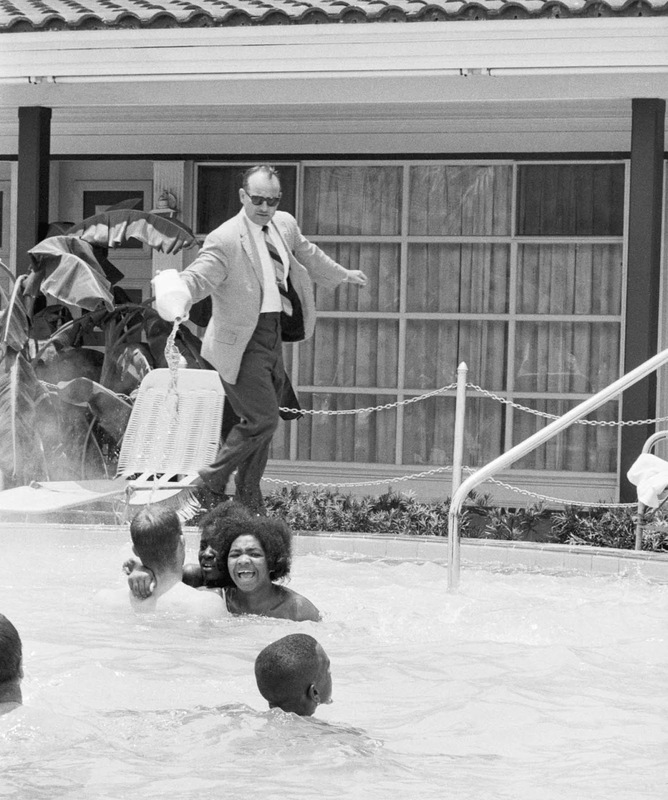 In some cases whites poured acid in pools in order to prevent Black people from using them. 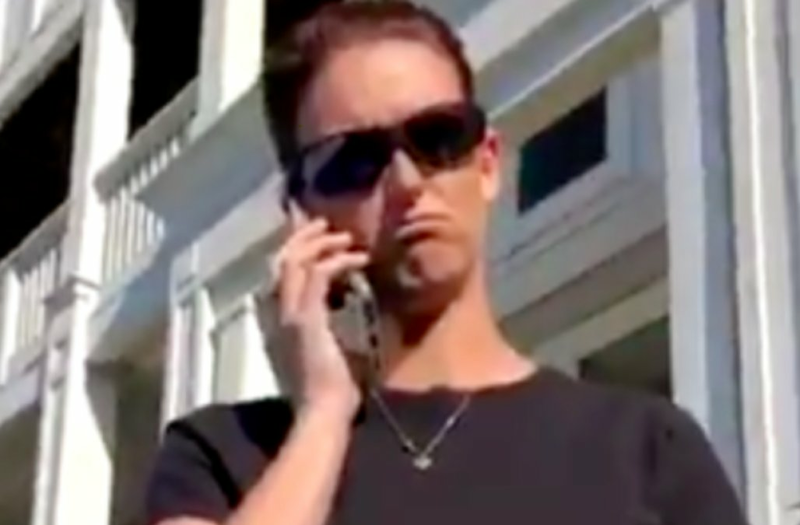 I don't know if any of this was in the minds of the white female police officer and white female property manager who confronted Shayne Holland and forced him to leave the pool that he was paying to use and/or lounge around. However, it seems pretty apparent from the video shared that the women, especially since the property manager KNEW HOLLAND, weren't so much interested in verifying Holland's identity as they were in establishing that they were white and they said so was all that Holland needed to know. Again, keep in mind that at any point in time the police officer could have called for backup and/or resorted to deadly force. And instead of someone who has had his ego, pride and self-respect bruised we'd be talking about another poor brother who got done in because he had a run-in with the police. Over time this repeated fight or flee stress has a very negative impact on your blood pressure and other health indicators. I have to believe this is one reason that black men die so young compared to everyone else..
Video of a black man being singled out for interrogation at an Indianapolis apartment swimming pool has gone viral. It's the latest video in the past several weeks of black people being questioned about whether or not they belong at a swimming pool. In this latest incident, 23-year-old Shayne Holland is being questioned by a female police officer at the River Crossing at Keystone Apartments while sitting on a pool lounger. He said his property manager, who he knows well, was called over to discuss the problem but he was still asked to leave the pool area. He recorded the incident and shared it on his Twitter page. Holland, who shows his apartment key to the officer and manager, is heard asking, "Why do I have to leave my pool?" The company that manages the apartments told the Indianapolis Star newspaper that the apartment manager has been put on leave in the wake of the video.